Indian fast bowler Mohammed Shami has shut down trolls after coming under fire for sharing a family photo on social media. The 26-year-old cricketer was trolled after he posted a picture on Facebook of himself and his wife Hasin Jahan. Users soon began attacking the sportsman for not “keeping” his wife befittingly attired. The photograph features Hasin wearing a sleeveless maroon gown. This did not go down well with some users who said Shami had flouted the Sharia by “allowing” his wife to don a sleeveless outfit. Some even questioned if the cricketer had forgotten how “wives should be kept” while others told him to keep her veiled and “follow the teachings of Islam”. Shami hails from the northern Indian state of Uttar Pradesh and is among India’s leading fast bowlers. He has been away from the international cricket of late due to an injury. Hasin is a former model who gave up her career after marrying the cricketer two years ago. The dress that Mrs Shami is wearing is extremely elegant and dignified . Any one who has any problem with it is sick in his mind . 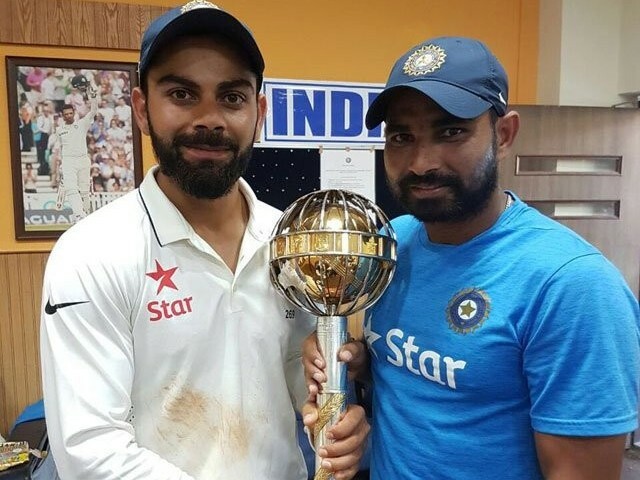 Mohammed Shami, V r with U. The fast bowler, who received support from several journalists and cricketers, remained unfazed by the attack. He responded to the hate by posting more photos of his family, telling trolls to mind their own business. This is not the first time an Indian celebrity has been targeted by trolls. Last week, Bollywood power couple Kareena Kapoor and Saif Ali Khan were rapped on social media for naming their newborn Taimur.